The Kraft Heinz failure showcases the dangers of over focus on cost cutting. The business paradox that maximizing profits every single minute of every day will cause failure fully shows itself. That’s because investment – later returns from costs now – plays a key role. Maximizing profits now means no spending on later returns. No research takes place. No development does either. It’s not just about products either. It’s about exploring markets, running advertisements and discovering trends too. Change struck the food production industry fast and hard. People are moving to healthy foods. 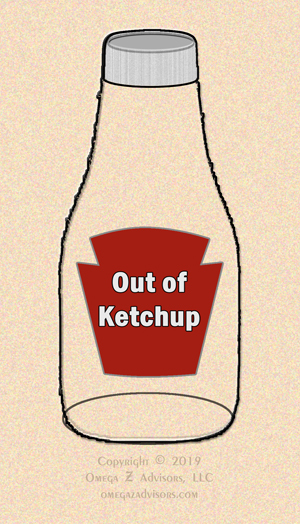 About twenty percent of Kraft Heinz’s household brands are over a hundred years old. They seem out of date. 3G Capital bought and merged Kraft Foods and Heinz back in 2015. Known for ruthless and disciplined cost cutting, 3G ran with this strength. Great profits soon followed. If a business maximizes its profits every minute of every day, it will go out of business. Comparing pre-merger to today, 3G cut research and development by 62%. It cut advertising by 34%. Sales declined by 13%. (WSJ). No doubt, cost control is important. A balance exists though. That balance changes with conditions too. It’s rarely clear what it is. Still, no business can cost cut its way to success. Change soon catches up. At some point, sales need to happen. Cutting costs is always easier than figuring out and selling to changing buyer tastes. In times of peace, nations don’t need a large army. In war, they do. When change declares war, it’s not time to cut costs on future returns. New products, advertising and marketing strategies need to come to the fore. When change attacks hard and fast, it’s not time to respond with more of the same. More of the same caused the shock. Yes, new stuff increases the risk to the franchise. Yet, isn’t it at risk already? Kraft Heinz went from a great start to a sad end in less than four years. In the end, dynamic change tests how quickly a firm can adapt. That includes efficient, effective decision making. It’s not just about execution speed. The speed of threat identification and assessment, the speed of strategizing and planning, and the speed of decisions count too. It does no good to execute in a month if the rest took years. The time to instill such a culture is now. In crises, people recoil. They act cautiously or rashly. They focus on what has worked, not what will work. Are your people ready for the shock? Additional background: “Kraft Heinz And Its Investors Taste The Food Industry’s Woes,” The Economist, February 28, 2019.